The Winning FG2900, the headgear of pros. 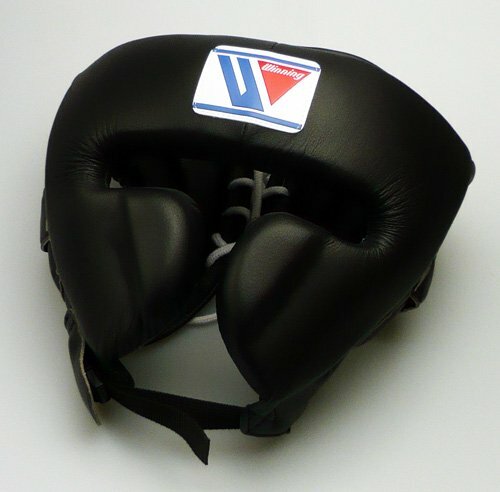 With unrivaled protection and comfort, the FG2900 is the most ideal Boxing headgear of today. It has easily become my favorite, no headgear can match it 100% without losing a point or two in other categories. Like always, Winning has created a masterpiece. The padding used in the FG2900 is layered. The inner layer is soft which helps in comfort and also allows the headgear to mold to your face. The FG2900 literally hugs your face due to the padding used. The outer layer is more firm which allows it to better absorb shock. The protection is almost unrivalled. Due to the thick cheeks the FG2900 offers the best nose protection of any headgear that’s not a facesaver. The cheeks combined with the forehead also do an amazing job at protecting the eyes. The cheeks also help to roll off hooks, they almost deflect them off. As I stated earlier the padding used does an amazing job at absorbing shock. The only complaint when it comes to protection is the very minimal, almost nonexistent back and side padding. This means any rabbit punch either on purpose or by accident will land flush. This is the tradeoff you get though as adding back padding would change the low weight. This is the only headgear I’ve used that literally hugs your face. I have used replicas of the FG2900 and while they come very close to the FG2900 no headgear has been able to mimic that “hug.” Even the edges, the piping, of the headgear sort of fall down and try to shape to your head. The headgear rounds out perfectly which just adds to the incredible comfort. It’s a piece of gear that feels like it was made specifically for the person using it. The vision of the FG2900 is unbeatable. Even some open face headgears have worse vision than this. Your peripheral vision is unaffected and the cheeks also don’t obscure anything. Even in kickboxing this headgear allows you to see the kicks coming. Absolutely perfect vision overall, almost like you’re not wearing anything. Being made by Winning it is to be expected that the FG2900 is of the highest quality possible. Of course, Winning delivers. My headgear is the most perfect, error free piece of gear that I own. The materials used by Winning are incredible, from the synthetic, to the leather. Expert quality and unrivaled durability because of that. Even the plastic quick clip is thick and durable. It’s very easy to clip on and off and it can definitely take some shots and not come undone. The only low quality part of the FG2900 would be the included laces as they are easy to split apart. My headgear is half synthetic, half leather. Specifically, the leather is on the exterior while the synthetic is the interior. I suppose I wasn’t clear enough with my order of full leather but honestly I don’t mind at all. While Winning’s leather is my favorite out of all the brands I’ve used, Winning’s synthetic is amazing. Very soft, pleasing to the eye, and without a doubt durable. Synthetic does heat up a little more than leather but I don’t mind it at all. A lot of people absolutely despise synthetic because of that but unless a headgear has built in AC then don’t expect it to be cold after rounds of sparring. Overall I can see this headgear lasting years and years of heavy use and still looking almost good as new afterwards. As I said, probably the most perfect piece of gear that I own. Besides the laces, the quality and construction of the FG2900 is perfect. A good example of Winning perfection is the little details such as the piping. Winning’s piping on the FG2900 is straight through and through. Other brands though you don’t really see that, you end up with wavy piping and while that doesn’t hurt the performance at all it definitely demonstrates Winning’s attention to detail. Just like their gloves, if various other companies try to replicate your design then you obviously have a great formula. I have nothing but praise for the design. I think it’s perfect or about as close to perfect as any brand has come. From the foam composition, to the materials, to the cheeks, to the closure, everything is absolutely incredible. The foams and overall shape help fit perfectly to your head. The cheeks protect the nose exceptionally considering this isn’t a face saver. The layered foam absorbs shock better than any headgear I’ve used. The only issue the FG2900 has is that the sides and back padding are almost nonexistent. Very thin, absolutely minimal padding, and it definitely doesn’t protect much at all. Personally I haven’t had an issue with this but I know various other people have so it’s something worth mentioning for sure. Depending on where and when you buy an FG2900, the price can range from $140-$250+. Mine cost $200 with a couple cents and I don’t regret it at all. I actually plan on buying another, more custom one down the line. The price tag is well worth it and while not everyone agrees with that, you get what you pay for and then some. In my opinion it’s worth spending $200 to protect your brain for years and years than spending $30 on a headgear that’ll last you two months and leave you rocked after every good punch. The FG2900 comes in four sizes, 21in-23in for medium, 22.5in-24.5in for large, 23.5in-25.5in for 2 large, and lastly 25in-28in for 3 large. My head measures in at exactly 23.5in so i went with the large. My FG2900 fits perfectly, not too big, not too small, literally perfect. The cheeks aren’t spread apart wide or extremely close, its not too tight or too lose. Almost no headgear fits this perfectly. The Winning FG2900 is the headgear of champions. One of the only headgears trusted by the best of the best. In my opinion the most perfect gear I’ve ever used. Winning yet again constructed an almost unbeatable product. Lobo purchased this Winning FG2900 headgear himself for the full price. This did not influence the outcome of this review.